With just one month until Michael Cohen is scheduled to report to federal prison, an attorney for the former fixer on Thursday lobbed a last-ditch effort to delay his client’s incarceration, offering congressional Democrats what he says are new documents relevant to their investigations into President Donald Trump in an attempt to win their support and secure a reduced sentence. 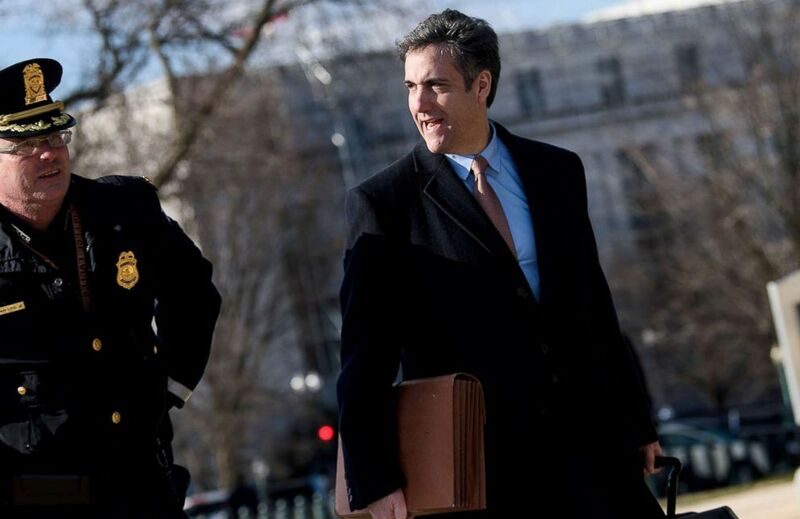 (Brendan Smialowski/AFP/Getty Images, FILE) Michael Cohen, President Donald Trump's former personal attorney, arrives to testify before the House Intelligence Committee at the U.S. Capitol in Washington, D.C., on March 6, 2019. In addition to offering new information, Davis asked the leaders to write their own letter back to Cohen's legal team documenting Cohen’s cooperation and value to their probes of the president "not as advocates for Mr. Cohen but simply to state the facts." "It is our hope that the authorities in the Southern District of New York will consider this total picture of cooperation by Mr. Cohen, verified by your letter and the important new evidence he has made available or could make available to assist the government, and the particular facts involved here to grant Mr. Cohen a reduced term following the rules and procedures of the Southern District of New York," Davis wrote. Davis pleaded with lawmakers to support Cohen, who is scheduled to serve a three-year prison sentence starting on May 6. Cohen in December pleaded guilty to various crimes, including campaign finance violations, tax evasion and lying to Congress. "For him to surrender in 30 days would be a detriment to committees search for truth, as well as a miscarriage of justice," Davis said in a statement released in conjunction with the letter. The letter from Davis included a lengthy memo detailing Cohen’s previous interactions with congressional committees and Mueller's team. Cohen testified before the Senate Intelligence Committee, House Intelligence Committee, and House Oversight Committees in February and March. The memo appears to largely consist of previously reported testimony and documents provided to congressional committees, news reports, and the president's tweets about Cohen. A spokesman for House Intelligence Committee Chairman Adam Schiff declined to comment on the letter from Davis. A spokesperson for House Oversight Committee Chairman Elijah Cummings did not immediately comment. Cohen in November pleaded guilty to lying to Congress about a Trump Tower project in Moscow that the president's real estate company was pursuing at the same time he was running for president in 2016. Cohen had told congressional committees that the project ended in January 2016 but later said it continued well into the campaign, at least until June of that year. After his closed-door hearing before House Intelligence Committee in February, Republicans accused Cohen of lying to the committee and called on the chairman to release his testimony. Reps. Jim Jordan, R-Ohio, and Mark Meadows, R-N.C., have referred the matter to the Department of Justice. Cohen and his legal team have stood by the testimony. In his statement on Thursday, Davis argued Cohen has cooperated with investigators and Congress by submitting a significant amount of evidence or participating in multiple testimonies, but his client is the only person in the Trump Organization who has been prosecuted. "The actions against Mr. Cohen appears to be selective prosecution and the sentence imposed is a disproportionate one," Davis said in the statement.